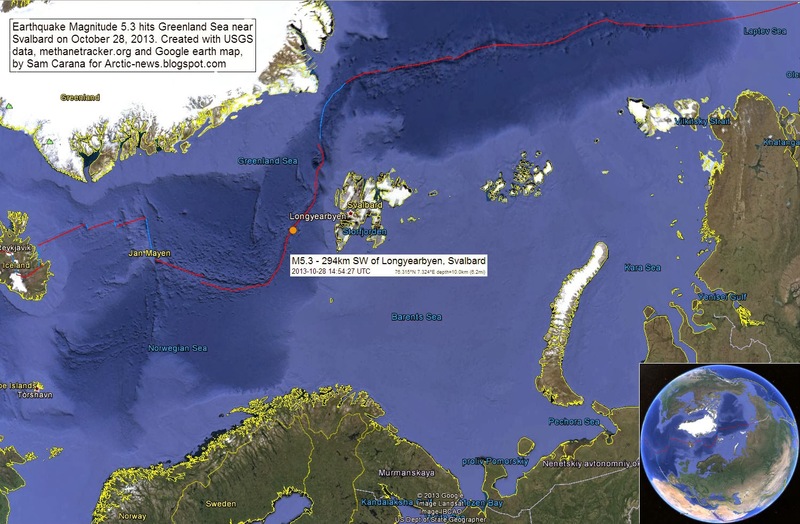 An earthquake with a magnitude of 5.3 on the Richter scale hit the Greenland Sea near Svalbard on October 28, 2013. For a long time, huge sea surface temperature anomalies have shown up in the area where the earthquake hit. The image below compares the situation before and after the earthquake hit. These huge sea surface temperature anomalies were discussed before, in the September 19, 2013, post Is the North Pole now ice-free? This post mentions that sea surface temperatures in some spots close to Svalbard are far higher than even in the waters closer to the Atlantic Ocean. In some of these spots, sea surface temperatures are well over 10°C (50°F). The post continues: Where does this heat come from? These hot spots could be caused by undersea volcanic activity; this is the more dangerous as this area has seen methane bubbling up from destabilized hydrates before; the dangers of this situation have been discussed repeatedly, e.g. in the April 2011 post Runaway Global Warming. Indeed, the big danger is large abrupt release of methane from destabilized hydrates. 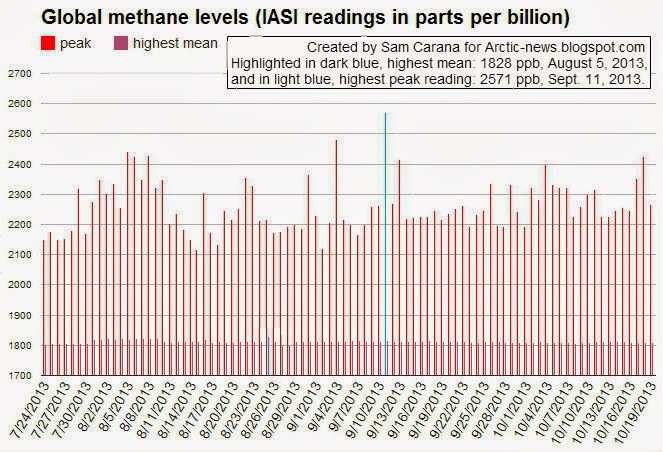 At the moment, the amount of methane entering the atmosphere over the Arctic Ocean is already huge, as illustrated by the image below that shows high methane readings over the past few days. We'll keep monitoring the situation. and Ecology & Evolutionary Biology at University of Arizona. McPherson's website: summary and update on climate change. As described by the United Nations Advisory Group on Greenhouse Gases in 1990, temperature rise “beyond 1 degree C may elicit rapid, unpredictable and non-linear responses that could lead to extensive ecosystem damage”. We’ve clearly triggered the types of positive feedbacks the United Nations warned about in 1990. Yet my colleagues and acquaintances think we can and will work our way out of this horrific mess with permaculture (which is not to denigrate permaculture, the principles of which are implemented at the mud hut). Reforestation doesn’t come close to overcoming combustion of fossil fuels, as pointed out in the 30 May 2013 issue of Nature Climate Change. Furthermore, forested ecosystems do not sequester additional carbon dioxide as it increases in the atmosphere, as disappointingly explained in the 6 August 2013 issue of New Phytologist. Here’s the bottom line: On a planet 4 C hotter than baseline, all we can prepare for is human extinction (from Oliver Tickell’s 2008 synthesis in the Guardian). John Davies concludes: “The world is probably at the start of a runaway Greenhouse Event which will end most human life on Earth before 2040.” He considers only atmospheric carbon dioxide concentration, not the many self-reinforcing feedback loops described below. 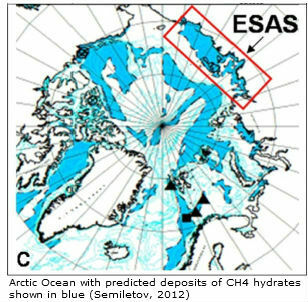 Methane hydrates are bubbling out the Arctic Ocean (Science, March 2010). According to NASA’s CARVE project, these plumes were up to 150 kilometers across as of mid-July 2013. 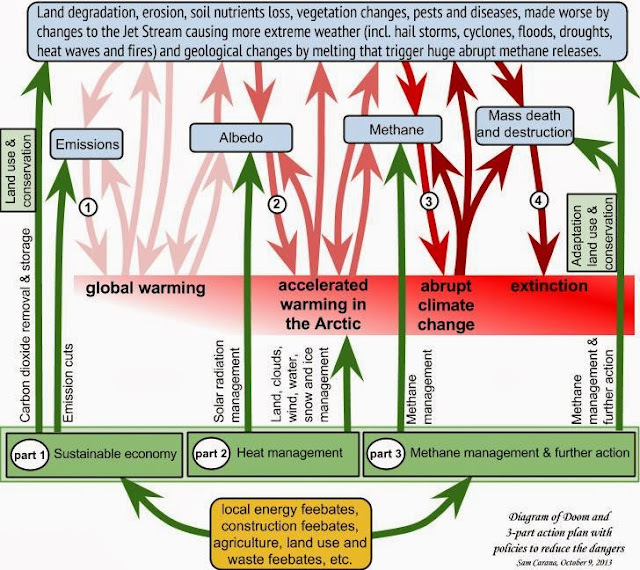 Whereas Malcolm Light’s 9 February 2012 forecast of extinction of all life on Earth by the middle of this century appears premature because his conclusion of exponential methane release during summer 2011 was based on data subsequently revised and smoothed by U.S. government agencies, subsequent information — most notably from NASA’s CARVE project — indicates the grave potential for catastrophic release of methane. 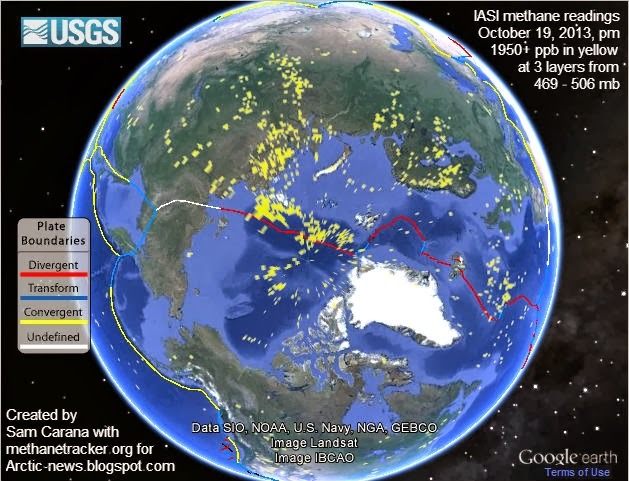 Catastrophically rapid release of methane in the Arctic is further supported by Nafeez Ahmed’s thorough analysis in the 5 August 2013 issue of the Guardian as well as Natalia Shakhova’s 29 July 2013 interview with Nick Breeze (note the look of abject despair at the eight-minute mark). Drought in the Amazon triggered the release of more carbon than the United States in 2010 (Science, February 2011). In addition, ongoing deforestation in the region is driving declines in precipitation at a rate much faster than long thought, as reported in the 19 July 2013 issue of Geophysical Research Letters. Russian forest and bog fires are growing (NASA, August 2012), a phenomenon consequently apparent throughout the northern hemisphere (Nature Communications, July 2013). The New York Times reports hotter, drier conditions leading to huge fires in western North America as the “new normal” in their 1 July 2013 issue. A paper in the 22 July 2013 issue of the Proceedings of the National Academy of Sciences indicates boreal forests are burning at a rate exceeding that of the last 10,000 years. Summer ice melt in Antarctica is at its highest level in a thousand years: Summer ice in the Antarctic is melting 10 times quicker than it was 600 years ago, with the most rapid melt occurring in the last 50 years (Nature Geoscience, April 2013). Although scientists have long expressed concern about the instability of the West Atlantic Ice Sheet (WAIS), a research paper published in the 28 August 2013 of Nature indicates the East Atlantic Ice Sheet (EAIS) has undergone rapid changes in the past five decades. The latter is the world’s largest ice sheet and was previously thought to be at little risk from climate change. But it has undergone rapid changes in the past five decades, signaling a potential threat to global sea levels. The EAIS holds enough water to raise sea levels more than 50 meters. As nearly as I can distinguish, only the latter feedback process is reversible at a temporal scale relevant to our species. Once you pull the tab on the can of beer, there’s no keeping the carbon dioxide from bubbling up and out. These feedbacks are not additive, they are multiplicative. 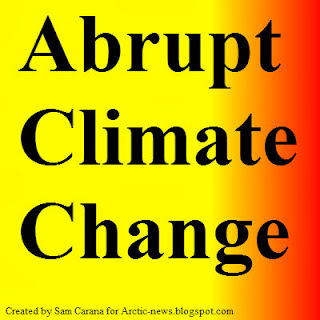 Now that we’ve entered the era of expensive oil, I can’t imagine we’ll voluntarily terminate the process of drilling for oil and gas in the Arctic (or anywhere else). Nor will we willingly forgo a few dollars by failing to take advantage of the long-sought Northwest Passage. An increasing number of scientists agree that warming of 4 to 6 C causes a dead planet. And, they go on to say, we’ll be there by 2060. Earth-system scientist Clive Hamilton concludes in his April 2013 book Earthmasters that “without [atmospheric sulphates associated with industrial activity] … Earth would be an extra 1.1 C warmer.” In other words, collapse takes us directly to 2 C within a matter of weeks. Several other academic scientists have concluded, in the refereed journal literature no less, that the 2 C mark is essentially impossible (for example, see the review paper by Mark New and colleagues published in the 29 November 2010 issue of the Philosophical Transactions of the Royal Society A). At the 11:20 mark of this video, climate scientist Paul Beckwith indicates Earth could warm by 6 C within a decade. 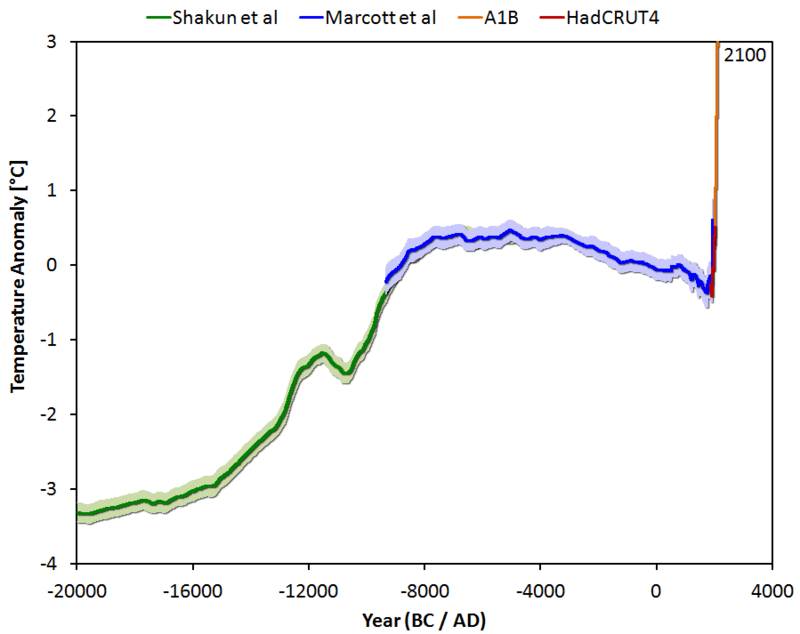 the reconstruction of regional and global temperature for the past 11,300 years published in Science in March 2013. One result is shown in the above figure. Below is a video of a recent presentation by Guy McPherson. Presentation by Guy McPherson in Boulder, Colorado on October 16, 2013. Below are some extracts from the video, again slightly edited. 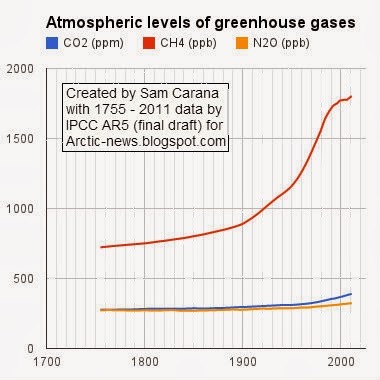 Malcolm Light in 2012 concluded, based on data from NOAA and NASA, that methane release had gone exponential and was leading to the demise of all life on Earth, not just human extinction, by the middle of the century. So 3.5 C to 4 C is almost certainly a death sentence for all human beings on the planet, not because it'll be a warmer planet, but because the warming of the planet will remove all habitat for human beings. Ultimately we're human animals like other animals, we need habitat to survive. Changes we see in three or four decades happen as a result of what we do today. There's a huge lag between our actions today in the consequences down the road in terms of the Earth's planetary systems. Without plankton in the ocean, there goes roughly half the global food supply. The ability to lose land plants is growing rapidly and there goes the other half for the food supply for human beings. If we have up to 5 C by 2050, that'll certainly do the trick. Why is this happening? It's civilization that drove us into population overshoot. We cannot go back anymore since 1939, since we invented nuclear armageddon. There's no going back. If we ceased the set of living arrangements at this point, the world's 400 or so nuclear power plants melt down catastrophically and we're all dead in a month. We cannot terminate industrial civilization until we decommission all nuclear power plants. It takes at least 20 years to decommission a nuclear power plant. The bad news is that means that the world's four hundred or so nuclear power plants meltdown catastrophically in a short period of time. Fukushima represent a major threat to humanity. If they fail in moving the spent fuel rods next month, according to nuclear researcher Christina Consola, if one of those MOX fuel rods is exposed to the air, one of the 1565, it will kill 2.89 billion people on the planet in a matter of weeks, so nuclear catastrophe is right there on the horizon. People ask me: Why are you presenting this horrible information? Action is the antidote to despair even if the action is hopeless. When a medical doctor knows that somebody has cancer, it's malpractice if they don't tell that. So I'm doing that. I think Bill McKibben and James Hansen and a whole bunch of climate scientists are guilty of malpractice. Because they know what I know. Almost every politician in the country knows what I know. All the leaders of the big banks know what I know. And they're lying to us. I'm just presenting the information from other scientists here. I'm trying to the widest extent possible not to infuse my opinion in the situation. It's John Davies who on September 20, 2013, taking into account only carbon dioxide, says there will be few people left on the planet by 2040. It's Malcolm Light, writing in February 2012, who assesses the methane situation. And so on. Yes, I agree with them, and that agreement is illustrated by me showing you that information. I promote resistance against this omnicidal culture, not in the hope that it will save our species, but in the hope that it will save other species. Because as E.O. Wilson, biologist at Harvard, points out, it only takes 10 million years after a great extinction event, before you have a blossoming full rich planet again. That's what we're working toward. We're saving habitat for other species at this point. An earthquake with a magnitude of 7.3 on the Richter scale hit the waters 231 miles (371 kilometers) east of Japan on October 25, 2013, reports rt.com, adding that the quake prompted an evacuation at the devastated Fukushima Daiichi plant and that strong tremors could be felt on Japan’s main Honshu Island, as well as on the northern island of Hokkaido. 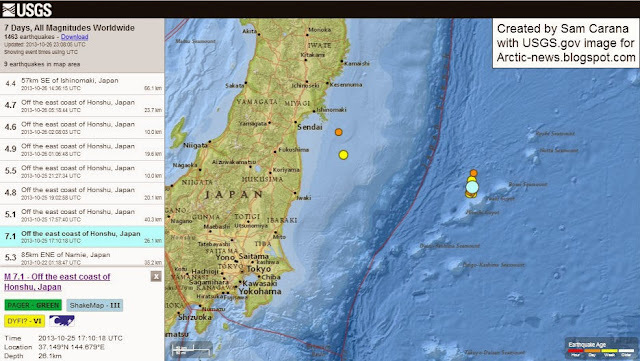 USGS.gov reported the quake as having a magnitude of 7.1 followed up by several smaller quakes, as indicated on the image below, which also indicates the location of Fukushima. The image below shows that methane readings of 1950+ were recorded on and around the location where the earthquake hit. The image merely shows methane that did enter the atmosphere. 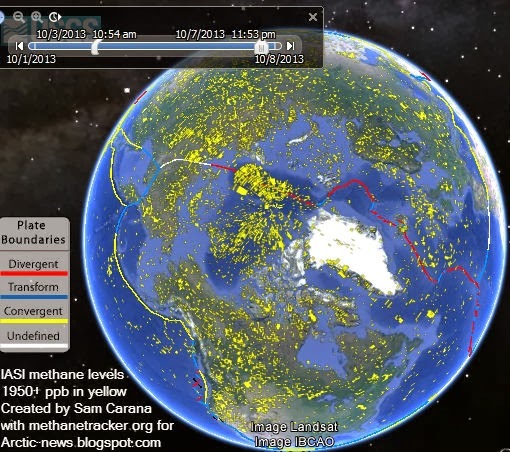 More methane will have escaped from the seabed, but much of it will have oxidized in the water. 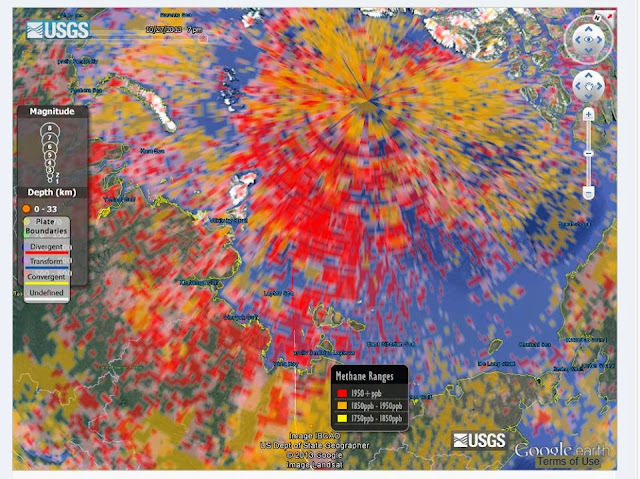 As the above image clearly shows, earthquakes can trigger methane releases from the seabed, as previously discussed in the post Methane Release caused by Earthquakes. Global warming is contributing to the occurance of earthquakes. 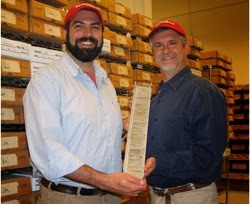 For years, geophysical hazard specialist Bill McGuire has studied this impact of global warming, in particular the Earth's crust bouncing and bending in response to the melting of the great ice sheets and the filling of the ocean basins—dramatic geophysical events that triggered earthquakes, spawned tsunamis, and provoked a series of eruptions from the world's volcanoes. Bill McGuire warns that staggering volumes of melt water poured into the ocean basins, warping and bending the crust around their margins. The resulting tossing and turning provoked a huge resurgence in volcanic activity, seismic shocks, and monstrous landslides—the last both above the waves and below. 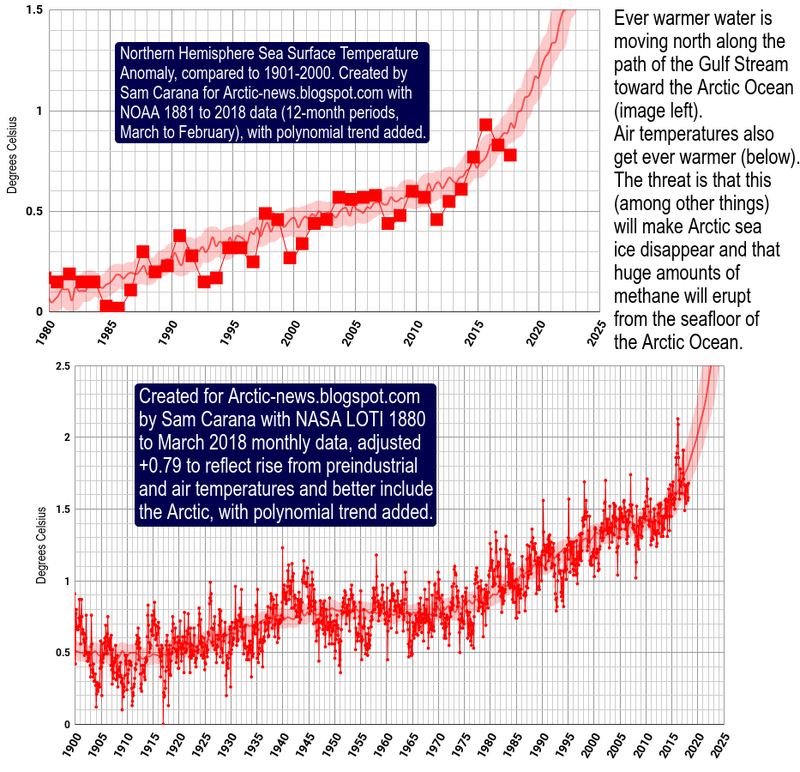 According to calculations posted by Doyle Doss in January 2012, the increase in weight of the Pacific Ocean over the last 50 years due to freshly introduced water from land ice melt is 10 Trillion 331 Billion 125 Million 200 Thousand TONS. In conclusion, global warming is making methane releases triggered by seismic activity worse. 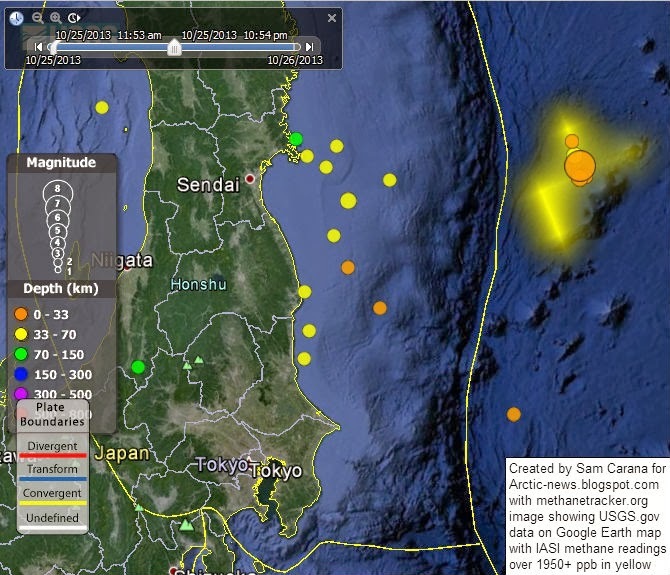 The fault lines around Japan are interconnected with other fault lines, as illustrated by the image below, from the post High Methane Levels over Laptev Sea, showing methane readings on October 20, 2013 pm. Earthquakes can trigger further earthquakes, especially along the same or interconnected fault lines. The image below shows methane readings on October 25, 2013 pm, indicating that high methane readings continue to be recorded over the Laptev Sea. The above image also shows that the Laptev Sea was hit by an earthquake with a magnitude of 4.6 on the Richter scale on September 28, 2013. Earlier, on August 7 and on September 9, earthquakes with similar magnitudes had hit the Laptev Sea closer to land, as described in the post Earthquake hits Laptev Sea. 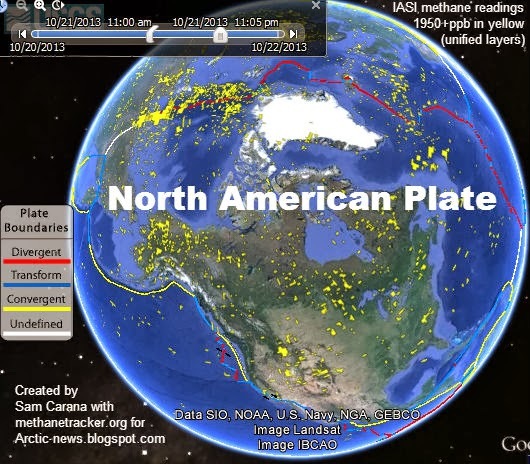 For more than a month, large amounts of methane have been present over the Arctic Ocean, in particular over the Gakkel Ridge and, more recently, also over the Laptev Rift. Sediments under the Arctic Ocean contain huge amounts of methane in the form of hydrates and free gas. 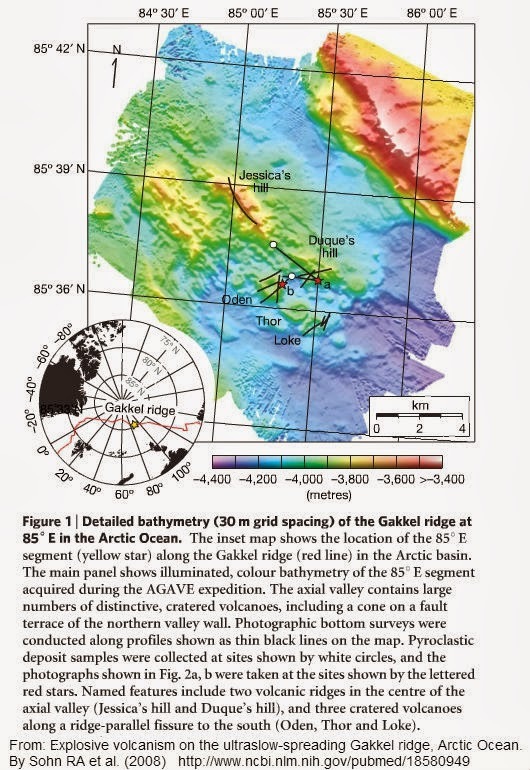 Some areas, such as the Gakkel Ridge and the Laptev Rift are prone to earthquakes, volcanoes and landslides, as they are part of a tectonic fault line that crosses the Arctic Ocean. 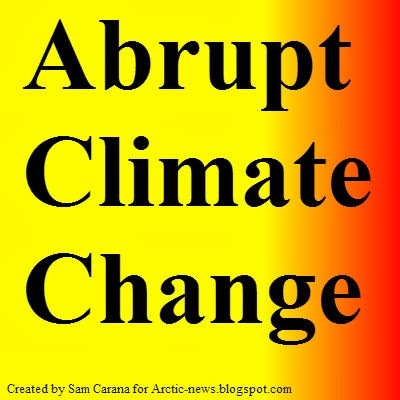 The danger is that, as the permafrost retreats and the snow and ice cover declines rapidly, methane in the Arctic is on the brink of being released abruptly and in large quantities from the seabed. A single earthquake, perhaps even outside of the Arctic Ocean could set this off. There are many more factors that influence seismic activity, such as the position of sun, moon and stars, and the depth at which seismic activity occurs, as tremors can be felt far away from earthquakes that occur at greater depth. 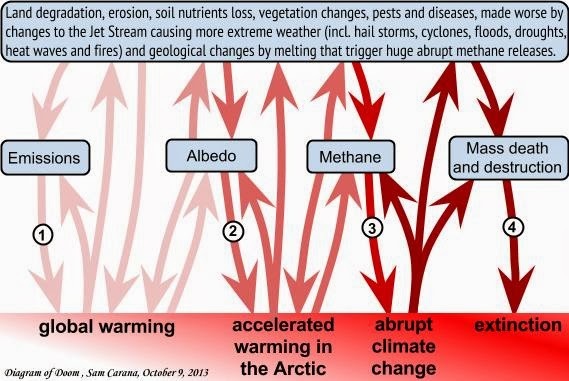 Anyway, the danger is that earthquakes will trigger abrupt release of methane from the seabed of the Arctic Ocean, and since methane is a powerful greenhouse gas, such a release could further accelerate local warming, triggering further destabilization of methane in the seabed, escalating into abrupt climate change across the globe. The depth of the seabed is also important in this regard, since shallow seas can warm up rapidly, while methane that escapes from the seabed has less chance to get oxidized in shallow seas. Large parts of the Arctic Ocean are very shallow, in particular the Laptev Sea, as further descibed in the post methane hydrates. 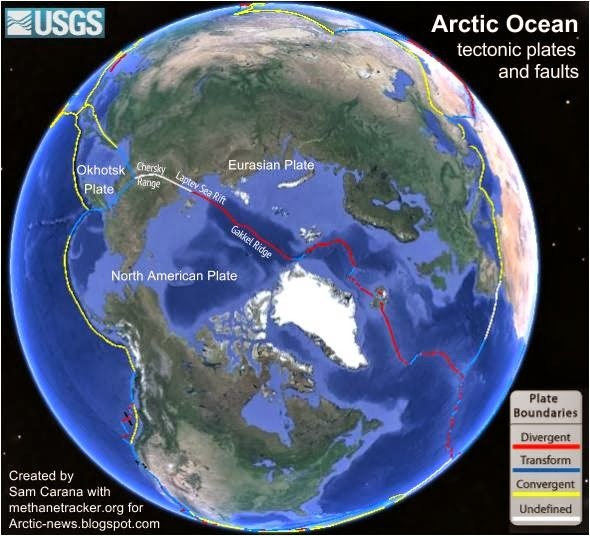 A major fault line crosses the Arctic Ocean, forming the boundery between two tectonic plates, the North American Plate and the Eurasian Plate. These plates slowly diverge, creating seismic tension along the fault line. 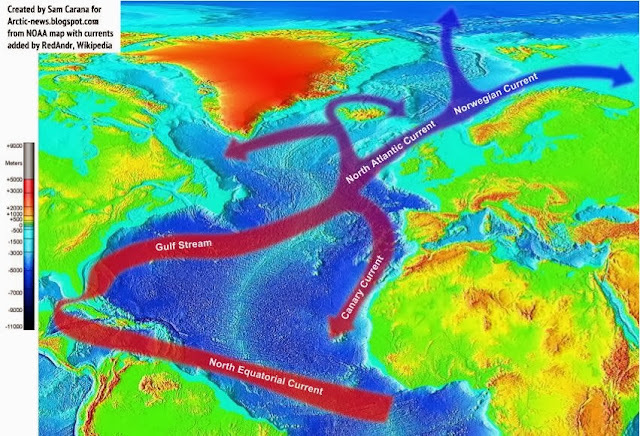 From where the Mid-Atlantic ridge enters the Arctic Ocean, it is called the Gakkel Ridge. The fault continues as the Laptev Sea Rift, on to a transitional deformation zone in the Chersky Range in Siberia, then the Ulakhan Fault between the North American Plate and the Okhotsk Plate, and then continues as the Aleutian Trench to the end of the Queen Charlotte Fault system. Above map shows the location of some of the main points of interest, i.e. the Laptev Sea Rift and the Gakkel Ridge, where high methane readings have been recorded recently, as shown in the image below. 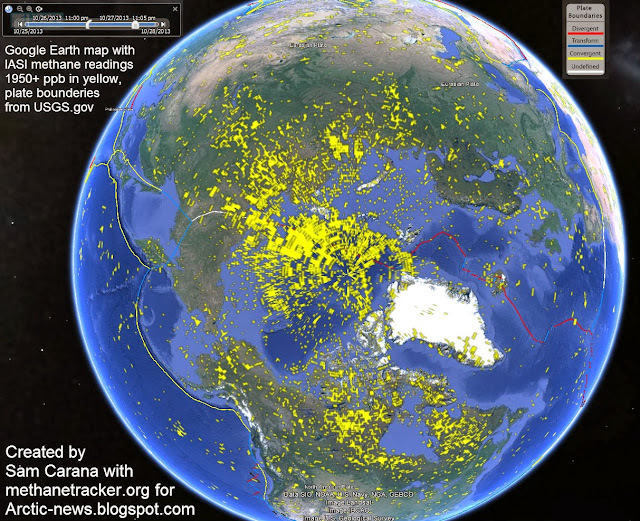 Indicated in yellow are all methane readings of 1950 ppb and over, for a period of just over one day, October 19 - 20, 2013. To pointpoint more closely where methane is venting along the Laptev Sea Rift, the image below gives readings for October 20, 2013, pm, at just three altitudes (607 - 650 mb). This is a very dangerous situation, since high levels of methane have been recorded over the Arctic Ocean for more than a month now. 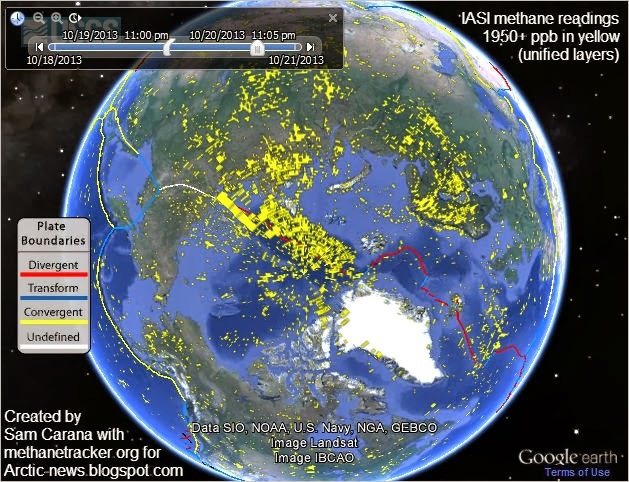 Furthermore, large amounts of methane have vented in the Laptev Sea area in previous years. Added below is an edited part of a previous post, Unfolding Climate Catastrophe. 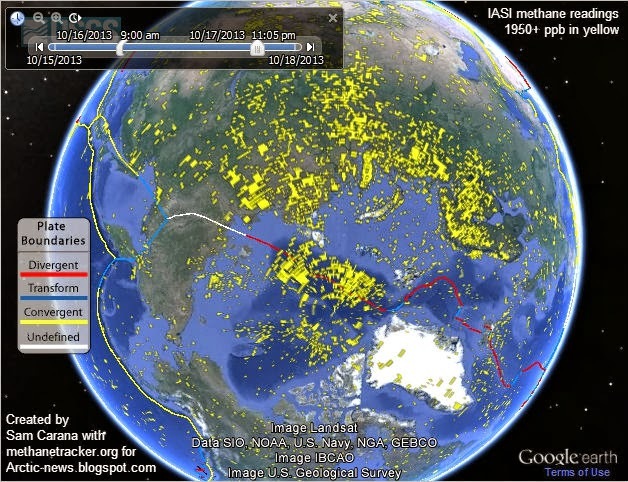 In September 2005, extremely high concentrations of methane (over 8000 ppb, see image on the right) were measured in the atmospheric layer above the sea surface of the East Siberian Shelf, along with anomalously high concentrations of dissolved methane in the water column (up to 560 nM, or 12000% of super saturation). The authors conclude: "Since the area of geological disjunctives (fault zones, tectonically and seismically active areas) within the Siberian Arctic shelf composes not less than 1-2% of the total area and area of open taliks (area of melt through permafrost), acting as a pathway for methane escape within the Siberian Arctic shelf reaches up to 5-10% of the total area, we consider release of up to 50 Gt of predicted amount of hydrate storage as highly possible for abrupt release at any time". In 2007, concentrations of dissolved methane in the water column reached a level of over 5141 nM at a location in the Laptev Sea. For more background, see the previous post, Unfolding Climate Catastrophe. 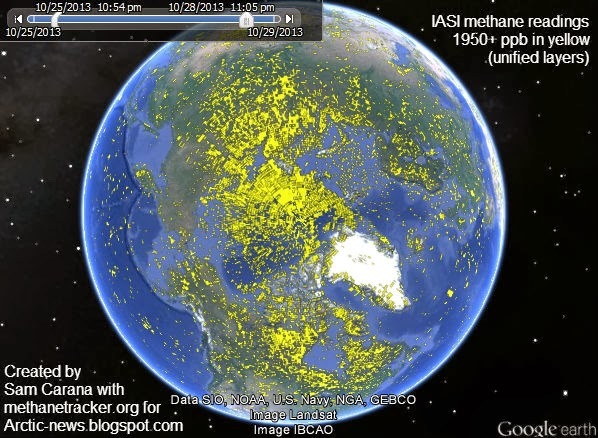 Satellite measurements show methane readings of up to 2411 ppb on October 20, 2013. Sadly, no current data are available from measurements in the Laptev Sea, neither methane levels in the water, nor atmospheric methane levels just above sea level. Perhaps in time, some data will become available from expeditions. The image on the right, created with IPCC data, shows that methane levels have risen even stronger than levels of two other greenhouse gases, i.e. carbon doxide (CO2) and nitrous oxide (N2O). 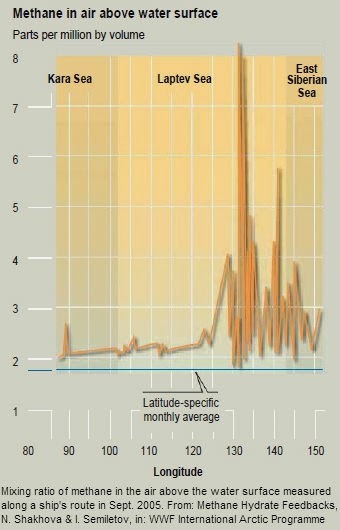 Methane levels have risen strongly over the past few years, especially over the Arctic. 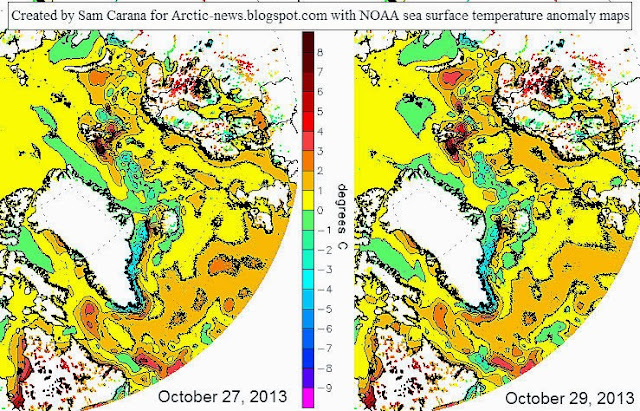 Previous posts at this blog have illustrated that, from early October 2013, high methane readings have shown up persistently over the depths of the Arctic Ocean. The persistence of these readings indicates that this methane wasn't blown there from elsewhere. Furthermore, the presence of methane appears to line up closely with the fault line that crosses the Arctic Ocean and extends into Siberia and further into the Sea of Okhotsk. 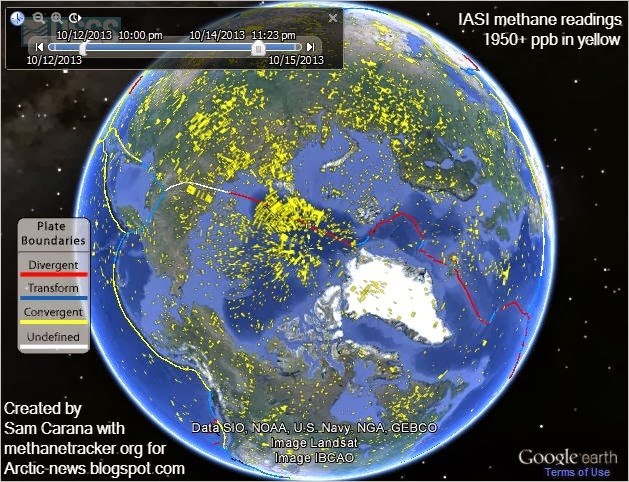 The latest data show a continuation of this worrying methane presence over the Arctic Ocean. On October 18, 2013, readings of up to 2426 ppb were recorded. As the above image shows, high peak readings have occurred over the past few months. Currently, however, high readings can be more clearly attributed to methane venting from the depths of the Arctic Ocean. 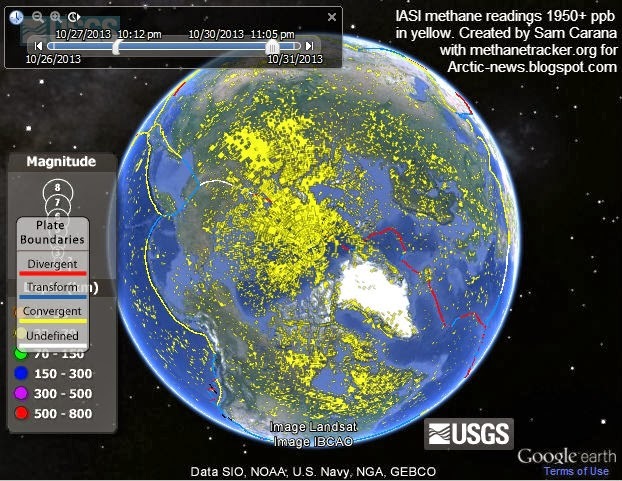 On the image below, methane shows up very prominently over the Arctic Ocean. For more background, see posts below. 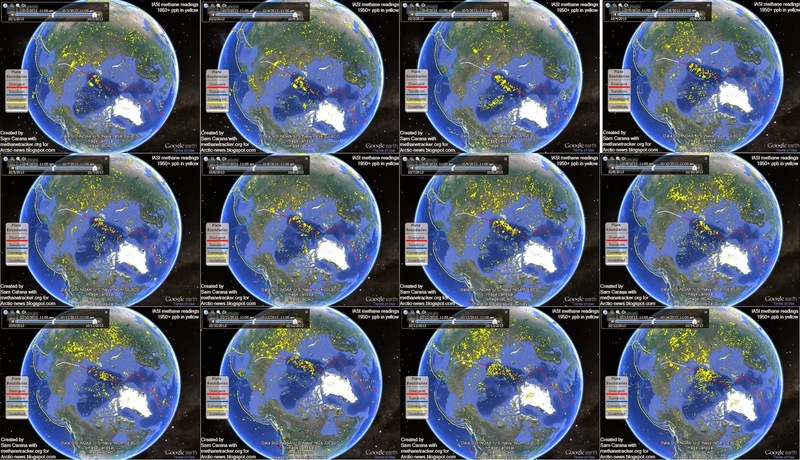 The above image shows that, over a period of less than two days, huge amounts of methane show up over the depth of the Arctic Ocean, especially along the fault line that crosses the Arctic Ocean and extends into Siberia and further into the Sea of Okhotsk. On October 17, 2013, readings of up to 2351 ppb were recorded. The above image shows that such high readings have occurred before over the past few months. This time, however, this high reading can be more clearly attributed to methane escaping from the depth of the Arctic Ocean, as also indicated by the image below that shows that at 469 mb (i.e. 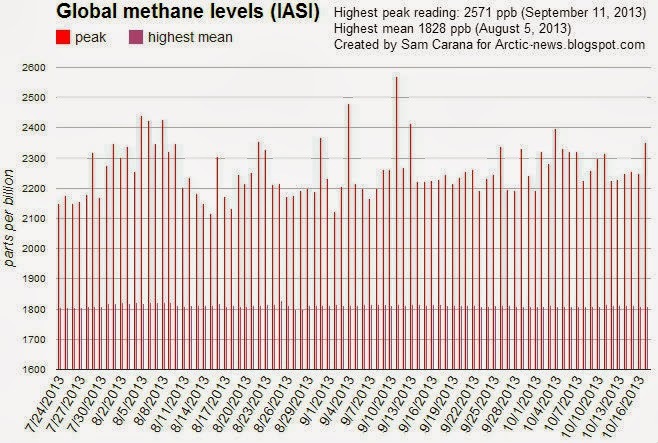 the altitude at which this high reading was recorded on the afternoon of October 17) methane was predominantly present at higher northern latitudes. The methane that appears over the depth of the Arctic Ocean is likely have traveled a long path through the vertical water column before entering the atmosphere. Clearly, some of the methane must have oxidized in the ocean. Therefore, methane must be escaping from the seabed in amounts far higher than what is visible in the air. Below follows some history regarding this unfolding methane catastrophe. Note that methane concentrations in the water are measured in nM, while methane concentrations in the atmosphere are typically measured in parts per billion (ppb). 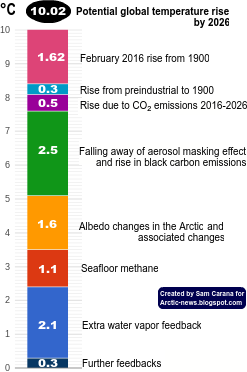 In early October 2013, high atmospheric levels of methane started to appear over the depth of the Arctic Ocean.9 See image at top for most recent readings. 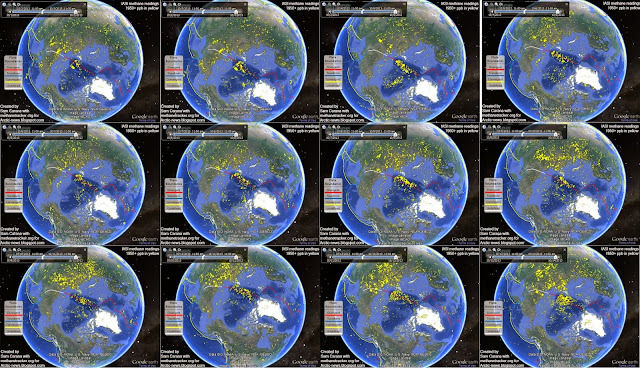 The image below contains 12 frames, with methane readings recorded over 12 days in the first half of October 2013. 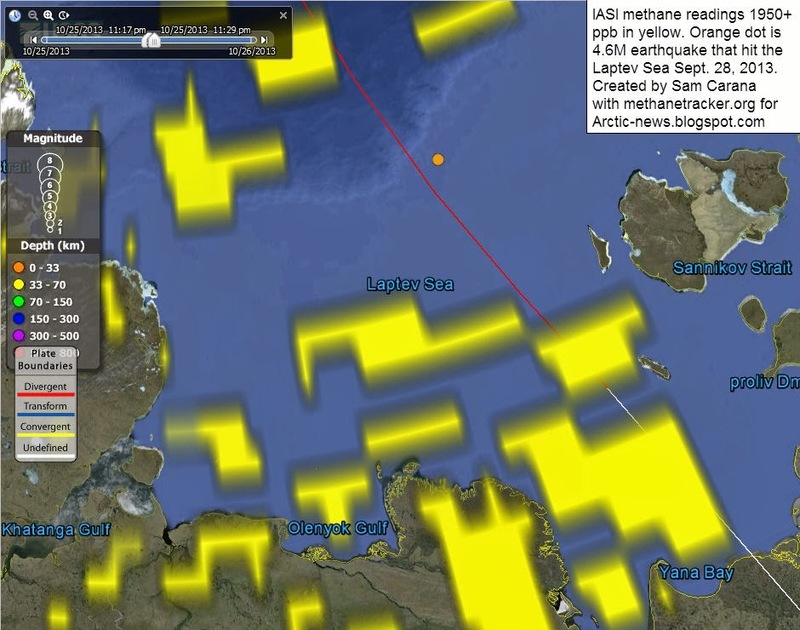 As discussed in earlier posts at this blog, high methane readings have been recorded recently over the depth of Arctic Ocean. Above image shows that these high readings are continuing. 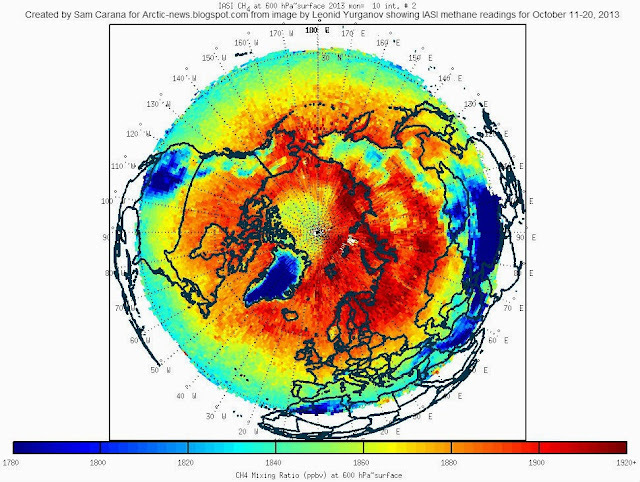 The image below shows that at 469 mb, the altitude at which the highest reading was recorded on the afternoon of October 13, methane shows up very prominently over the Arctic Ocean. 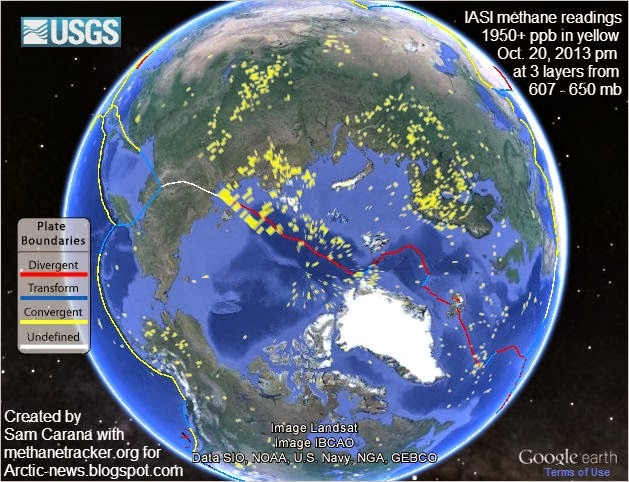 The fact that little methane shows up elsewhere indicates that methane is present at high levels, at times over 2200 ppb, over the depth of the Arctic Ocean, and that these high levels result from methane that originates from hydrates under the seabed. The image below, with methane readings over the past few days (from October 12 10:00 pm to October 14 11:23 pm), shows high levels of methane over the depth of the Arctic Ocean. The image below shows methane readings at 586 mb, the altitude at which the highest methane reading was recorded on the afternoon of October 14 (a reading of 2248 ppb). 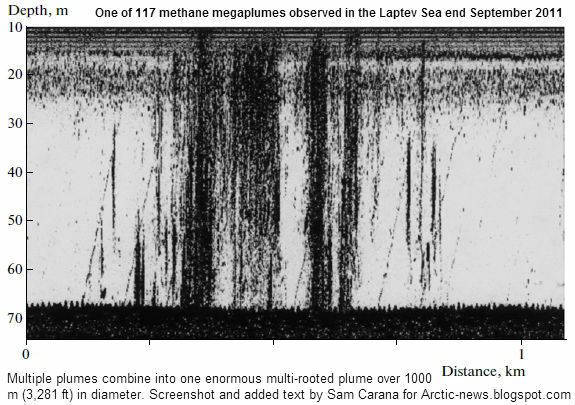 Again, methane is present very prominently over the depth of the Arctic Ocean.